My first Sunday in Indonesia, we attended Jakarta Praise Community Church. It’s a community of about 5,000 worshippers who gather on Sundays in a large auditorium in Jakarta’s Central Business District. It’s a JKI (Jemaat Kristen Indonesia) congregation, part of the global Mennonite family through Mennonite World Conference. We arrived late and had to line up at the door, ended up sitting with around 200 or so others in a foyer and watched the service through the open door and by closed circuit TV. It was really unlike any Mennonite congregation I’d ever attended before, both in size and techno-savvy. I traveled to Indonesia before Christmas to attend a Conference on the Peace Church in the Asian Context and to connect with partner congregations in Indonesia. I visited with Troy Landis from Franconia congregation and Andre who attended Philadelphia Praise Center. I met with Dan and Jeanne Yantzi who are members of West Philadelphia Mennonite Fellowship and talked with former Mennonite Central Committee interns Nofika and Henny. It was a real privilege and gift to see the vibrancy of Franconia Conference connections literally on the other side of the world. Before my trip, I stopped at the Mennonite Heritage Center in Harleysville (Pa) to purchase some gifts of hospitality. I took small fraktur prints by Roma Ruth, redware pottery and quilted potholders, symbols of Pennsylvania Dutch Mennonite life. 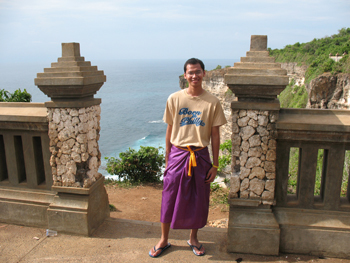 I carried them carefully to Indonesia, exchanging them for intricate batik cloth and bright Balinese prints. I returned knowing a few more words in Indonesian and with a deeper understanding of the complexities that our Indonesian brothers and sisters face as they worship and work both in Indonesia and abroad. 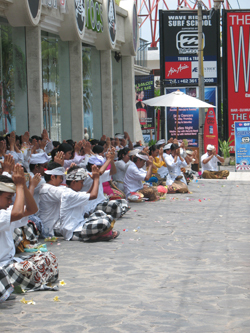 Indonesia is the world’s largest Muslim country and the fourth most populous nation in the world, after the United States. It’s scattered across hundreds of islands and bears the scars and the fruit of years of interaction with other cultures, from Indian to Arabic, to Dutch, Japanese and US American. It’s an amalgamated nation in many ways, constructed from a plurality of island cultures and tribes. I was overwhelmed by islander hospitality frequently. The Mennonite Church is present in various incarnations in Indonesia. Our relationships in Franconia Conference with the emerging Indonesian Anabaptist community on the East Coast have been primarily forged through ties with GKMI (Gereja Kristen Muria Indonesia), an Indonesian-originated Mennonite movement that connected with the Dutch. However, we continue to build new relationships, discovering the resonance of Anabaptist perspective with a people who have faced persecution, are committed to justice and peacemaking and searching for God in the midst of migrations. Dutch Mennonites wondered whether those of us who would become the originating community of Mennonites in eastern Pennsylvania really needed to be migrating from their European homeland. They questioned the need, but continued to support their brothers and sisters as they streamed out of the continental interior to find places of freedom in William Penn’s colony. Indonesian Christians face much the same situation as those colonial migrating Swiss-Germans, a generalized anxiety from past persecution and occasional hostilities that remain. They sought a freedom from that persecution and anxiety in the same way, seeking passage to Philadelphia. There is a deep resonance with our history and a deep hope for our future as we work together. Though the situations are not the same, the contemporary situation for Indonesians in the United States echoes Mennonite history. When I told the story of Indonesian Christians to the sons and daughters of Russian Mennonite émigrés in Canada, they immediately asked how it would be possible to help, insisting that its our responsibility to help persons facing persecution or the possibility of persecution to escape before it’s too late. This Christmas Eve in Indonesia, the current president invited Christians to the government palace for dinner as an act of reconciliation and recognition. In Washington D.C., the Franconia Conference connected emerging Indonesian congregation was invited to gather at the Indonesian embassy. There is indeed a move intended as a reminder in Indonesia that the nation is open to its religious minorities, both Hindus and Christians. However, the current political climate is deeply affected by interpretations of both secularization and fundamentalism, much like the United States. It’s hard to predict future outcomes. As Sunday evening worship began at a small Mennonite congregation in suburban Jakarta, the adhan (Muslim call to prayer) bellowed from a speaker on a nearby mosque. It was loud and overwhelmed the small space. It was the first time that I have ever been preparing for Mennonite worship as the call to prayer also beckoned. The gathered congregation didn’t notice it really and continued to move toward Christian worship. I was the only one distracted by the newness of the situation. There are many things that I bring back from my encounters with our Indonesian brothers and sisters, but what stands out most is the vibrancy of faith and witness in the midst of religious otherness. The message of the Good News remains in the midst of fear and uneasiness. The message of the Good News continues to call to us . . .even in the midst of the adhan.